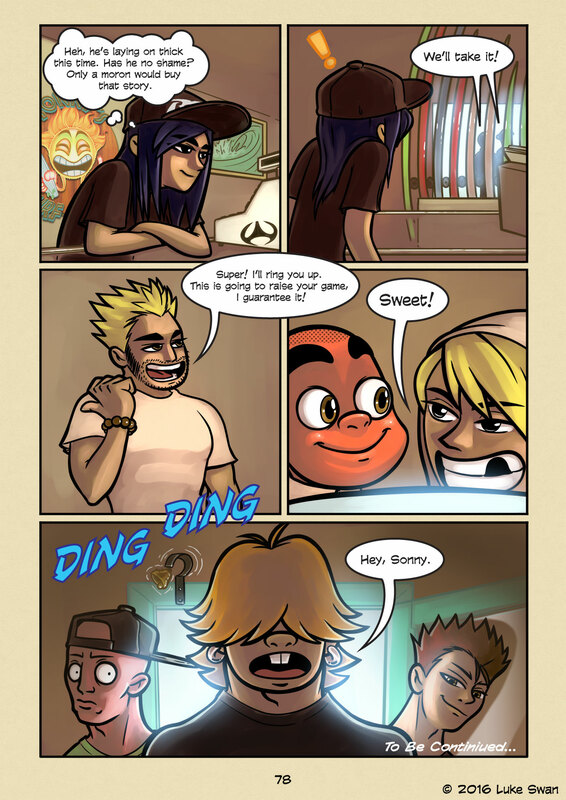 Splitting the Chapter (#078) | Web comic "Surfer Joe"
Well, we’re finally wrapped up on Chapter 3. It was the hardest chapter to make so far. It’s the first time with a lot of dialogue and more than just two characters in a scene. The original script called for eight characters(..eight!). They were all intermingling and stuff. It was pretty daunting to think about. But don’t think, just do, right? By the time I got to Sonny pitching the Masamune to Joe, the scope of the scene was starting to sink in. I had less than 10 pages left, but I had close to 20 pages of script. This is what I get for not numbering the pages as I write. I also had motivation problems. I got to the reveal of the surfboard, but how was Sonny going to convince Hiro to buy into the board for Joe? Hiro was too knowledgeable about the technical aspects of surfing to be fooled by just a shiny surfboard. It needed to appeal to his spiritual side. So came the story of the board’s creator, Tomo. Sonny’s story, by Kirra’s account at least, is a load of hooey. But at least part of it has to be true. By having Tomo almost drown on an epic day at Sendai Port, something Hiro would have heard of, or better yet there to witness, grounds the story in Hiro’s mind. He is more ready to accept the idea of a mystical surfboard that is somehow perfect. The only problem was the flashback had to be added to the script. I like to keep each chapter around the 25-page range and with this flashback chapter 3 was going to be blazing past that mark. There was a whole load of shenanigans planned for when Tyler arrives, so it made sense to split the chapter into two parts. The natural place for a cliffhanger is when Tyler arrives at the shop.